Below is a 10,000 foot picture of my setup, this does not have many of the finer details, the Database cluster (galera) was already existing along with the BI system. 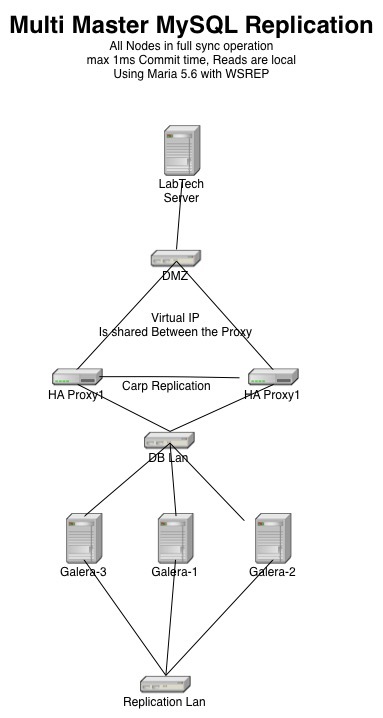 It is worth noting that we are using HAProxy on freebsd with carp to handle the Load balancing, we have in the past used GreenSQL as that helps with compliance issues, but for this purpose we are sticking the HAProxy. Ultimately my company may go the route of creating a turn key solution for this as we do for other apps for our customers. 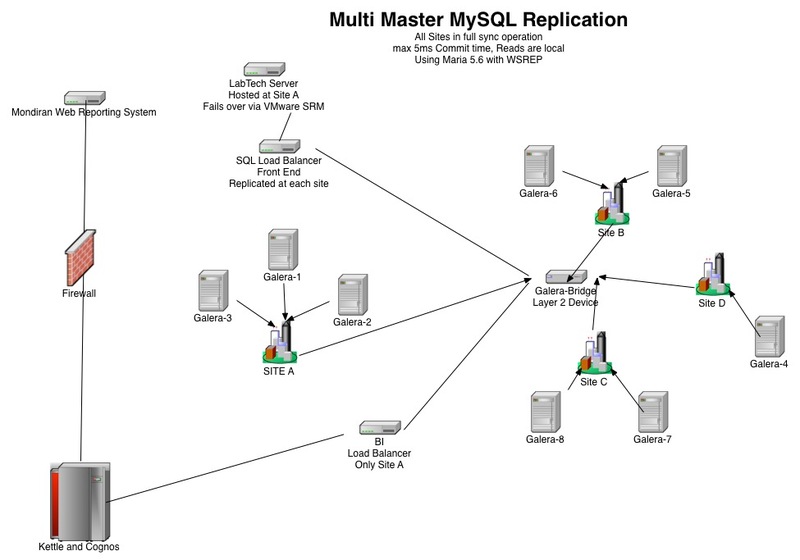 Here is a new diagram, this one is a bit simpler and shows what a typical HA Database setup would look like, my setup is very complex due to the nature of what we do. if you look at the my.ini file in your labtech mysql directory the majority of those can be copy and pasted directly into the my.cnf file (Usualy in /etc on linux or /usr/local/etc on FreeBSD) with the exception of the data path, on my install the config referenced non existent ssl key files do not copy those statements into the linux server as that will result in a fatal error. Very good stuff datagen, I have been thinking of investigating having redundant labtech servers for us as well. I am not familiar with many of the applications you mentioned, are you running the mysql (maria) db on linux or on windows? Ours is on windows, and I could do it easily on MSSQL via availability groups but I don't know how to do this with mysql. Would your solution help me at all? I don't need geo-redundant right now, just better availability of the database so labtech doesn't have to go down if I need to reboot for patching, but I would like it to scale to geo-redundant with minimal effort in the future preferably but just moving one of the servers offsite. Most of the Microsoft cluster came from ideas used in the Unix/Linux world but they implemented totally differently. Step 2, get 2 boxes running with a RHEL based linux (Centos or Oracle) you can do it with debian but I am not a Debian guy and they are just diffrent enough that it can throw you for a loop. RedHat is the 900lb gorilla in the enterprise market, with Suse being a close second. Question to the community, how many people would be interested if some one built a turnkey solution for this? and How much would it be worth to you? Also would you prefer such a solution as software + support or the Whole kit hardware included? I would also suggest Centos as a good (and free) RedHat equivalent. It's one of the more solid free Linux distributions that also has an incredible wealth of community support. I don't know how I didn't hear that news. Very interesting. Also if you buy there support contract (about half as much as Red Hats) you get ksplice which lets you do live kernel updates no reboot needed! kernel updates on the fly? That's witchcraft I say! Where such things have been ho hum day to day stuff for years. Has anyone been able to get this running? LabTech plans to hive off roles to separate servers which should make solutions like this a lot easier. We just bought LabTech today and we need HA. I have read that the 10.5 version should be easier to install in HA. On the LabTech roadmap its scheduled Q3/Q4 this year, but does anyone have exact release date/week? unsure, but been talking with the folks over there about it for some time now. "Clustering is not currently supported". "Unfortunately the use of Linux based clustering for MySQL\Database cannot be supported by us as far as a re-import of your data is concerned AND would also not be supported by support moving forward as it is a completely unsupported setup/configuration"
It does not matter if your issue is purely an application/upgrade problem with Automate - you can prove that until you are blue in the face - and you will still be doing a migration before any troubleshooting at all is attempted by them. TL;DR - Automate is NOT SUPPORTED in any manner of HA configuration, or with ANY involvement of Linux. End of story. They don't have the capability nor the interest to support it. If you have to have support for it for any reason at all, even if you only email them an average of once or twice a year, don't do anything with Linux or any sort of clustering at all. You're just wasting your time. By way of contrast, I recently had to do a ground up rebuild of our ESET management server. ESET's support doesn't seem to give a toss about what their product is on - they support seemingly every option you could want: clustering, proxying, MSSQL or MySQL, a vast variety of Linux distros plus Windows (although they drew the line at macOS for the server ), and they have rather good documentation - thus far, I've nothing but positive experiences with their support. If only Automate got even close to that level in those same regards, I'd surely be happy as a pig in mud. 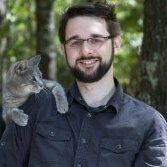 Any update to DataBase High Availability support or direction from ConnectWise? the reply back was that there is no support at all. No just for the database but as a whole. @datagen24 are you still running this setup? How has your experience been? How many agents do you have in your system?